Turn one-time donors into ongoing supporters with your newsletter list. More and more non-profits are discovering the importance of email marketing. It is an affordable and immediate way to connect with supporters in a personal way. Simply put, it’s something you can’t ignore. Charitable Newsletter Connect allows you to automatically add donors to your email newsletter list. The plugin integrates seamlessly with MailChimp, Campaign Monitor, MailerLite, Mailster and MailPoet (including version 3). Newsletter Connect allows you to enable one or more providers. You can set a default list, opt-in mode and label that is used for all campaigns, but you can also override this on a per-campaign basis. It’s even possible to have donors subscribed to multiple lists when they donate. MailChimp’s affordable pricing and excellent reputation have made it the go-to hosted email marketing provider for more than 12 million people. Just add your MailChimp API Key to your Charitable settings and you’re ready to start adding donors to your MailChimp list automatically. Campaign Monitor is one of the most popular email marketing providers around, with robust marketing automation features and highly rated 24/7 support. All you need to connect Campaign Monitor to Charitable is your API key and Client ID. MailerLite is an affordable alternative to MailChimp and Campaign Monitor, with advanced features like automation, popup & landing page builders and 24/7 support baked into every plan — even the free one. Get up and running with MailerLite and Charitable in minutes with your MailerLite API key. MailPoet allows you to create and send newsletters or autoresponders straight from your WordPress dashboard — no 3rd-party hosted service is required. We love seeing other WordPress plugins created with such love. MailPoet and Charitable are automatically connected when you have Charitable Newsletter Connect and MailPoet installed. No configuration necessary! Charitable works with both the current version of MailPoet as well as the upcoming MailPoet 3. 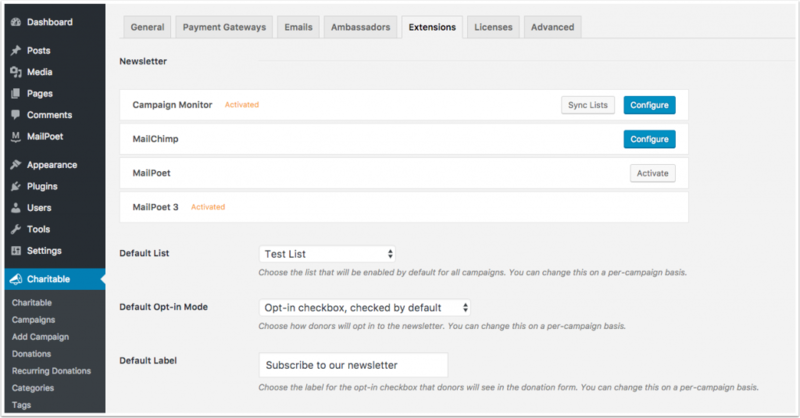 Mailster is another WordPress newsletter plugin that allows you to create campaigns, manage subscribers and set up powerful autoresponders in your WordPress dashboard. Everything is intuitive and easy to use. With Mailster, there are no recurring fees; it’s a once-off purchase of $49, which gives you access to lifetime plugin updates. Mailster and Charitable work together automatically when you have Newsletter Connect and Mailster activated. You don’t need to do anything to get it configured. Don’t use MailChimp, Campaign Monitor, MailerLite, Mailster or MailPoet? We’re planning to add support for more email marketing services. Let us know which provider you use.